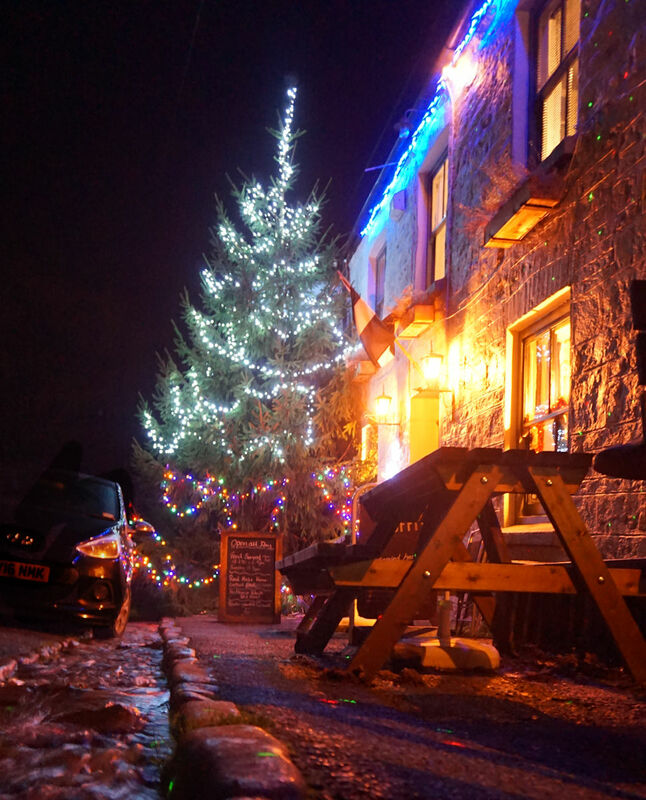 The pub in our village has got a truly magnificent Christmas tree this year! It also has a young stream running across the front of it, which creates some pleasing reflections. I walked past this morning and noticed a pile of dead pheasants on the picnic table on the right. I assumed someone had put them there until they were plucked, but later there was a Facebook post by the pub asking who had left them there. I assume they are a donation to the stew, but I wonder if they have found out where they came from yet. In kitten-related news, we decided to move Fankil into a big dog-crate, because we were worried about catching him to take to the vet. This went badly, when he got caught up in an old telephone wire and some speaker cable under the desk. I ended up with six bites on both hands and we both had to go to the minor injuries unit on Sunday night for antibiotics. Today we took Fankil in for his vaccination, wearing gloves, but he was actually very good this time, so our current theory is that he just panicked because he was caught up. Fortunately, it will now be a year before we have to pick him up again, so we have time to work things out with him! Gothmog, despite her name, seems to be getting on with everyone and washed Rosie's ears for her yesterday. Rosie seemed more resigned to this than enthusiastic, but that will do. Sorry about your injuries. I've 2 cats who are easy to take to the vet and 2 who are a nightmare. I've had cats that hid before, but this was my first experience of one that bit! Oh, poor Fankil, and poor you! It sounds like it's going to be a long-term project to gain his trust. But at least winter is coming, and if it gets cold enough he might be tempted into snuggling with someone eventually. I hope so. At least now his vaccination is done, he doesn't have to go anywhere or do anything, so with luck eventually he will get bored and at least come out so we can see him occasionally! How pretty and Christmas-y it looks! I hope your hands will heal quickly! A cat's love can't be stopped. out dogs resigned to Nils love-bombing them. He was never as happy as when he could snuggle in between Teddie and Tom on the sofa. I suspect Gothmog may be like that! 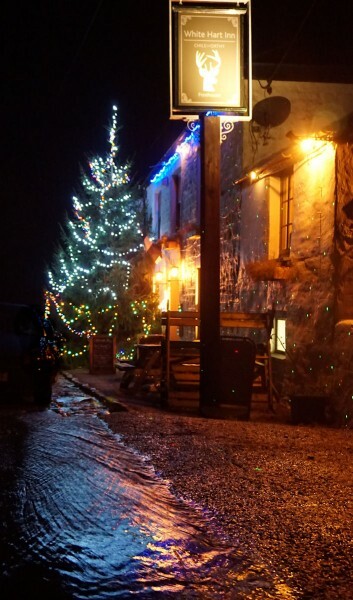 I'm rather proud of my sparkly photos, the pub is now using them for their facebook profile! I'm not sure that the stream is really supposed to run in front of it like that - I think that might be down to a blocked drain - but it certainly creates a nice set of reflections, with the tree and lights. Beautiful Angelica was a demon at the vet when she was a kitten. We still remember one vaccination that took four adults (vet with syringe in hand, vet's nurse, dog groomer called as the heavy cavalry when things seemed lost and myself) running around the office with a huge towel until she could be trapped on a wall (yes, vertically) so that the vet (who's quite short) was able to give her the shot. Bites and scratches galore. Her temper never quite improved at the vet - luckily she was a very healthy kitten! Wow, I suddenly feel I got off lightly! Poor Fankil, and poor hands. I hope he gets less scaredy soon. I am, though, smiling at the image of our adventuring party standing on top of that enormous mountain trying to imprison the original Fankil in a cat carrier. I doubt that would have gone well, either. The parallel with the Magical Net on the mountaintop didn't actually occur to me until I had stopped dripping blood on everything and we were coming back from the minor injuries unit plastered in plasters, but when it finally did, I could n't stop laughing. At least we can now say he is well named! My hair hasn't yet turned white, but perhaps that will come. Poor Fankil! Hopefully he'll settle soon, sounds like he just needs some time and space. Hope your hands are on the mend; Gizmo attempted to savage me occasionally but she basically had no front teeth so she couldn't even break my delicate skin!